Not long ago, we explored Three Military Adventures that Inspired George Washington and the influence that Lawrence Washington and his wartime service played in stoking George’s interest in military matters. Lawrence fought with the British in the War of Jenkins’ Ear in the early 1740s and spent time aboard the flagship of Admiral Edward Vernon, who commanded British forces during the Battle of Cartegena de Indias. Lawrence returned to Virginia with stories sure to spark his 10-year-old brother George’s imagination and desire for adventure. Lawrence’s military service and George’s interest in military things had a fascinating, if perplexing, practical outcome when, late in 1746, Lawrence proposed for 14-year-old George to join the Royal Navy. Portrait of Lawrence Washington attributed to Gustavus Hesselius (c. 1738). Credit: Wikipedia / Mount Vernon. This is a relatively little known and rather mysterious incident in the life of young George Washington. Few documents survive that address the matter directly. There are no documents written by George, Lawrence, or Mary Washington that reveal their actions or motivations in the matter. The three letters that do address the incident were all written by secondary figures involved. It all began in the fall of 1746 when Lawrence sent two letters — one each for George and Mary respectively – to Fredericksburg via Colonel William Fairfax. George was to deliver Mary’s himself and keep the one to him a secret from her. We do not know what either of these letters said. The Dr. Spencer mentioned may have been William Spencer, who often was involved as a witness for land transfers to Lawrence. The secretiveness of George hiding his letter from Mary and of Lawrence apparently enlisting his business partners to argue in favor of the proposal for George to go to sea emphasize the conspiratorial nature of Lawrence’s efforts. Jackson noted that William Fairfax was inclined to visit Mary and, moreover, Jackson noted that he himself would “take an opportunity to talk with her and will let you knew her result.” While Jackson may have let Lawrence know the result, no document has been found to let us know the result of these specific discussions two centuries later. “Action Between Nottingham and Mars” (1746) by Samuel Scott depicts a British-French naval battle in October 1746 when the Washingtons were debating whether George should join the Royal Navy. Credit: Wikipedia/National Maritime Museum. At some point, perhaps feeling outnumbered, Mary decided to solicit the advice of her brother Joseph Ball in England. Dated May 19, 1747, his reply, which is a disdainful rejection of the entire proposal, is worth quoting at length. Mary must have ultimately and definitely rejected Lawrence’s plan, a courageous act for a woman in male dominated colonial Virginia. George, of course, did not pursue a career at sea but turned to surveying instead. Like many incidents in young George Washington’s life, the historical record is elusive and often raises more questions than it answers. What prompted Lawrence to make the suggestion in the first place? What were George’s views on the proposal and the debate? What were Mary’s specific objections? None of these questions may ever be answered. Of course, the greatest question raised by the incident is the also unknowable counterfactual one. Would history have unfolded differently if the man who was supposed to have been the commander of the Continental Army ended up spending his life on the King’s ships? William Fairfax to Lawrence Washington, September 9, 1746, quoted in Moncure Daniel Conway’s Barons of the Potomack and the Rapphannock, New York, Grolier Club, 1892: 238, available at https://books.google.com/books?id=zDESAAAAYAAJ&dq=barons%20of%20the%20potomac%20and%20rappahannock&pg=PP1#v=onepage&q&f=false [accessed August 26, 2017]. Robert Jackson to Lawrence Washington, September 18, 1746, quoted in Moncure Daniel Conway’s Barons of the Potomack and the Rapphannock, New York, Grolier Club, 1892: 239-40, available at https://books.google.com/books?id=zDESAAAAYAAJ&dq=barons%20of%20the%20potomac%20and%20rappahannock&pg=PP1#v=onepage&q&f=false [accessed August 26, 2017]. Joseph Ball to Mary Washington, May 19, 1747 quoted in Marion Harland’s The Story of Mary Washington, New York: Houghton, Mifflin & Co, 1893: 79-80 available at https://archive.org/details/storyofmarywashi00harl [accessed August 26, 2017]. On Tuesday, September 12, 2017, Laura Galke, archaeologist, small finds analyst and site director at The George Washington Foundation, presented a lecture titled “The Mother of the Father of Our Country.” Laura examined how historical documents and newly-unearthed artifacts indicate that Mary Washington, George’s mother, faced challenges, governed her home, and managed the family’s plantations with a skill and determination that recent biographers have not appreciated. Laura explored how the Washingtons’ investments in attire, furnishings, and landscape modification reflect their strategy for overcoming setbacks and exhibiting British colonial refinement. The lecture was given at the Central Rappahannock Regional Library headquarters in Fredericksburg, Virginia. Join us at the Washington House Celebration on Saturday, October 7, 2017 from 12:00 p.m. – 4:30 p.m to celebrate the construction of the Washington house! A special ribbon-cutting ceremony will begin at 1:30 p.m. featuring notable speakers. After the ceremony, guests will be invited to view the reconstructed Washington house! Parking for the event is off site at the VRE Fredericksburg Park and Ride Lot G at the corner of Prince Edward Street and Frederick Street. Limited handicap parking is available at Ferry Farm. Buses will transport guests to and from Ferry Farm. The Washington House Celebration is a free event and RSVPs are not required. Learn more about the Washington House here and view other videos, photos, and blog posts about the project here. On Tuesday, September 5, 2017, Dave Muraca, director of archaeology and vice president of museum content at The George Washington Foundation, presented “Building George’s House: Introducing the New Ferry Farm,” his account of the last eighteen months as George Washington’s Ferry Farm witnessed the careful reconstruction of the Washington house using many traditional techniques. Dave reviewed the archaeology that made the reconstruction possible and recounted the work of the skilled craftsmen building George’s house. The lecture was given at the Central Rappahannock Regional Library headquarters in Fredericksburg, Virginia. As construction of the Washington house at George Washington’s Ferry Farm nears completion, we want to share the many years of archaeology, historical research, scientific investigation, skilled craftsmanship, and hard work that made building this reconstruction possible. Next month, The George Washington Foundation will present a lecture series titled George Washington: Boy Before Legend – Introducing the New Ferry Farm over three consecutive Tuesdays. First, on Tuesday, September 5, Dave Muraca, archaeologist and the Foundation’s vice president of museum content, will present “Building George’s House,” his account of the last eighteen months as Ferry Farm witnessed the careful reconstruction of the Washington House using many traditional techniques. Dave’s talk will review the archaeology that made our replica possible and recount the work of the skilled craftsmen building George’s house. Second, on Tuesday, September 12, archaeologist and artifacts analysts Laura Galke will present “The Mother of the Father of Our Country.” Laura’s lecture will examine how historical documents and newly-unearthed artifacts indicate that Mary Washington, George’s mother, faced challenges, governed her home, and managed the family’s plantations with a skill and determination that recent biographers have not appreciated. Laura will also discuss how the Washingtons’ investments in attire, furnishings, and landscape modification reflected their strategy for overcoming setbacks and for exhibiting British colonial refinement. Finally, on Tuesday, September 19, Meghan Budinger, director of curatorial operations, will survey how we plan to furnish the reconstructed Washington house in “The Rooms at Ferry Farm.” In recent years, accuracy in historic house museums has become a primary focus of the curator’s presentation to the public. How we know what we know about the past has become almost as interesting as the objects we curate. As such, curators are not only decorative arts scholars, but have adopted skills from genealogists, architectural historians, material cultural experts, scientists, and even investigative reporters. Meghan will discuss how the Washington house and the effort to accurately furnish its rooms is a prime example of the synthesis of all of these vocations. Each lecture will begin at 7:00 p.m. and admission is free. The lectures will take place at Central Rappahannock Regional Library Headquarters, 1201 Caroline Street, Fredericksburg, Virginia 22401. For more information, call 540-370-0732 ext. 24 or email hayes@gwffoundation.org. Then, in October, celebrate the construction of the Washington house at a special ribbon-cutting event at George Washington’s Ferry Farm. More details soon! March 6, 2017 was the 286th wedding anniversary of Augustine and Mary Ball Washington, George Washington’s amazing parents. In addition to calling to mind how grateful we are for their role in raising the boy who would become our courageous General and first president, this anniversary also provides us with an opportunity to discuss the circumstances of Augustine and Mary’s marriage, their family, and their eventful lives here in Stafford and Spotsylvania Counties. It was not Augustine Washington’s first time to the altar. His earlier marriage to Jane Butler in 1715 produced four children. Jane was likely 16 when she gave birth to their first son, Butler, who died in infancy. Butler was followed by Lawrence (b. 1718), Augustine Jr. (b. 1719 or 1720), and Jane (b. 1722). Their mother tragically passed away in 1729 just shy of her thirtieth birthday. This left young Lawrence (about 11 years old), Augustine Jr. (around ten), and Jane (about seven) without a mother. Their devoted father immediately began a judicious search for a proper wife for himself, a nurturing mother for his children, and an experienced household manager. He discovered such a gem in the Northern Neck’s attractive and highly eligible maiden, Mary Ball. Mary’s family had thrived in the Virginia Colony’s tidewater region for generations. Mary gained valuable experience managing property from her mother, Mary Johnson Ball who oversaw the family’s substantial resources after the death of Mary’s father Joseph Ball when Mary was only three years old. Mary’s mother again wed, and was soon widowed with additional resources to manage, thanks to the generosity of her devoted husband. When Mary was only 13, her mother passed away, and Mary joined the household of her older, half-sister Elizabeth Johnson. Thereafter, childbirth and childrearing became second nature to Mary who, as a loving aunt, gained valuable experience helping to nurture her sister’s children and perfecting the lessons in household management first learned under her mother’s tutelage. When it came to matrimony, anxious parents typically steered their children toward appropriate choices, especially among established and propertied clans as the Washington and Ball families. But death had robbed both Augustine and Mary of their respective parents and their wisdom. Some claim that Colonel George Eskridge, a prominent Northern Neck Lawyer and family friend, helped bring this destined pair together. While a parent’s concerns provided some guidance for young lovers, it was only one of several considerations for eager suitors. Ideally, the opportunity for social advancement, acquiring property (both land and enslaved labor), financial security, and – of course – affection were also carefully weighed. Mistress Mary Ball rang all of these “bells:” She was experienced with children. She had been tutored in plantation management and household skills by her experienced mother. Mary Ball’s generous and enviable dowry had accumulated to include 1000 acres of Virginia land, enslaved laborers, horses, cattle, and sundry personal belongings. Notably, the majority of her acreage bordered Augustine Washington’s iron mine in Accokeek, just one of Mary’s assets that Augustine found irresistible. On March 6, 1731, the pair joined. Mary was about 23 and her new husband Augustine was 37. Of Augustine’s three living children from his first marriage, Lawrence, Augustine Jr., and Jane, it was Jane who remained a daily part of their Westmoreland Plantation home. Mary continued the household training that young Jane started learning from her own mother. Lawrence and Augustine Jr. continued their education at the Appleby Grammar school in England where their father had attended school. Before their first wedding anniversary, Mary and Augustine welcomed their first son, George, into the world. He was born on February 11, 1731 (Old Style) in Westmoreland County. In all, their happy marriage produced six children: George (1732), Betty (1733), Samuel (1734), John Augustine (1736), Charles (1738), and Mildred (1740). All but little Mildred survived to adulthood. Just twelve years after their wedding, Augustine Washington passed away around the age of 48. Mary remained a widow throughout her long life, focused upon raising their children, and later playing an active and cherished role in the rearing and education of her grandchildren. Mary moved into the town of Fredericksburg in the spring of 1772, within easy walking distance of her daughter Betty’s household, headed by Fielding Lewis and known today as Kenmore. She was remembered fondly by her grandchildren and, at her request, was buried near Meditation Rock in Fredericksburg, Virginia. The Mary Washington Monument on Washington Avenue in Fredericksburg, Virginia. Today, August 25th, marks the 227th anniversary of the death of George Washington’s mother, Mary. Mary lived to be 82 years old, and suffered from breast cancer during her final years. Few biographers have been neutral in their treatment of Mother Washington, a woman of great significance in George’s life. Some writers have offered overly sentimental descriptions of this matron, whereas others have been critical, and even harsh in their evaluation of her role as George’s mother. Mary Ball married Augustine Washington on March 6, 1731. Their marriage produced six children: George, Betty, Samuel, John Augustine, Charles, and Mildred. When Augustine died twelve years later, a significant portion of the family’s property went to Augustine’s two oldest sons from his first marriage. Mary raised their five surviving children at their Ferry Farm home, keeping the family together. In 1772, at the insistence of her children, an aging Mary Washington moved into the town of Fredericksburg where she could be closer to her daughter, Betty. 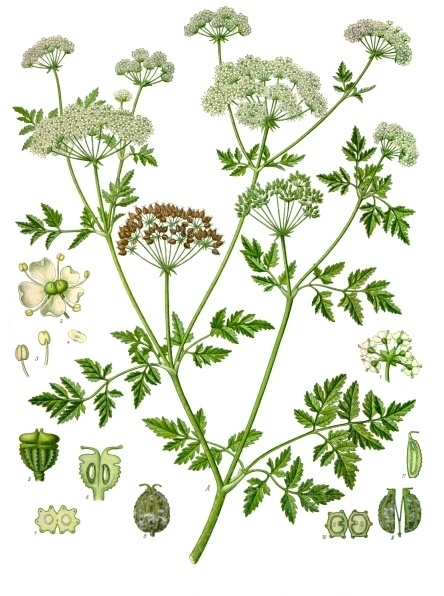 Hemlock, an extremely poisonous plant that “affects the transmission of nerve impulses to muscle and causes death through respiratory failure,” was a traditional treatment for breast cancer in the early 1700s. Although doctors in England had largely abandoned this treatment by the late 1780s, when Mary Washington was suffering from this disease, it is evident that local doctors were not up-to-date on the most recent treatments. These symptoms that Mary experienced in her final days, such as loss of speech and prolonged unconsciousness, seem consistent with hemlock poisoning, which attacks the nervous system and can cause comas. Side effects include loss of speech (Steger 1972:71; http://www.webmd.com/). George publically recognized his mother’s role in his life at a 1784 event where he addressed the citizens of Fredericksburg, when he referred to her, “…by whose Maternal hand (early deprived of a Father) I was led to Manhood”. On August 28th, Betty Lewis and her children buried Mary Washington near a rock outcropping known today as “meditation rock” (Hetzel 1903:5). The letter conveying the news of her death had still not reached her son George (Hetzel 1903:1), preventing him from attending the ceremony (cf. Rejai and Phillips 2000:15). The burial site was part of the Lewis family’s Fredericksburg plantation. This was a favorite spot of Mary’s, to sit, read the Bible, and spend time with her grandchildren. For some time, Mary’s grave had no permanent marker. 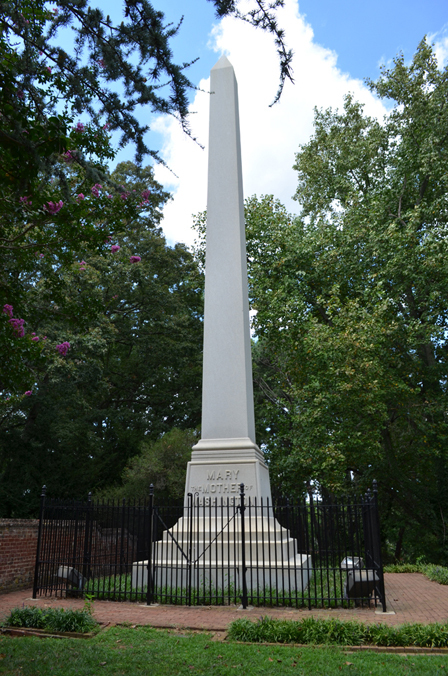 An attempt to move her remains to Mount Vernon stirred concerned local residents into action (NRHP 2002 Section 8, p. 21) and an effort was begun to place a marker on Mary’s final resting place in 1826. While a cornerstone for a marker was laid in 1833, construction failed to materialize a suitable memorial before 1893 when the Mary Washington Memorial Association brought this effort to fruition (NRHP 2002 Section 7 p. 16, Section 8, pp. 22, 27). In 1894 President Grover Cleveland, as well as his Vice President, the Governor of Virginia, the Mayor of Fredericksburg, a senator from Virginia, and thousands of citizens attended the dedication of the completed memorial (NRHP 2002 Section 8, p. 28). The Mary Washington Monument as it appeared in 1903. Library of Congress photo. This Saturday, August 27th, you can commemorate Mary Washington’s death with the Washington Heritage Museums at the grave of Mary Washington. A reception (cost $10) at the Mary Washington House on Charles Street follows. For event details, visit washingtonheritagemuseums.org. 1992 The Papers of George Washington, Confederation Series Volume 1. University Press of Virginia, Charlottesville. 1903 The Building of a Monument Press of Wickersham Company, Lancaster, Pennsylvania. http://www.dhr.virginia.gov/registers/Cities/Fredericksburg/1115262_Washington_Avenue_HD_2002_Final_Nomination.pdf (accessed August 11, 2016). 2000 The Young George Washington in Phychobiographical Perspective. The Edwin Mellon Press, Lewiston, New York. 1972 Native Plants Poisonous to Humans. Journal of Range Management 25(1):71-72.